Neti is easy ...and surprisingly pleasant! The practice of neti involves passing warm, salty water into one nostril and out the other. At first, many people are hesitant to try this. They're afraid they'll get that "water-up-the-nose" feeling. But neti is actually surprisingly easy, comfortable, and pleasant. Done properly, neti feels completely natural. The water used will be at about body temperature and the salt content equal to your tears. 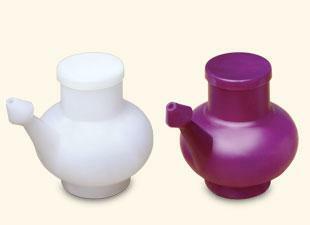 Neti has been practiced in India for thousands of years and is gradually becoming more popular in Western nations. In fact, in India, practicing neti is traditionally as common as brushing your teeth. It is a safe and effective practice for sinus health. However, if you have a preexisting sinus condition, consult your doctor before trying neti. Many people who never thought they could do neti have become lifelong practitioners. They love the clear-headed, easy-breathing feeling of optimal sinus health and can't imagine going more than a few days without it.